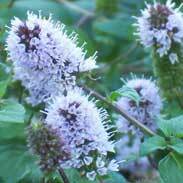 In herbal medicine we use the leaves of this famous mint. Getting up close to the leaf of a Peppermint plant and smelling it is probably the best way to know it's what you have. 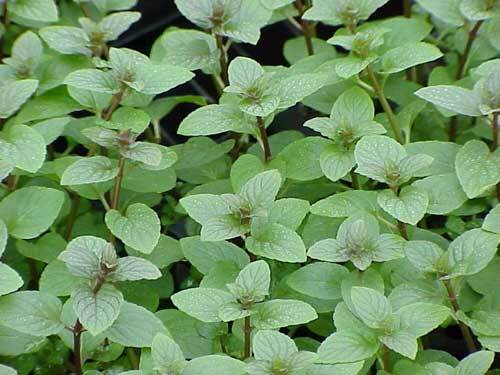 Mint leaves have similar, smooth looking characteristics but their smells are different enough to place them apart. 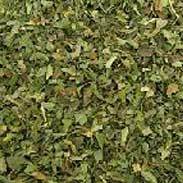 Peppermint has many historical and current indications. The 'after-dinner mint' of today has roots in ancient customs of concluding feasts with a sprig of Peppermint to soothe the stomach. 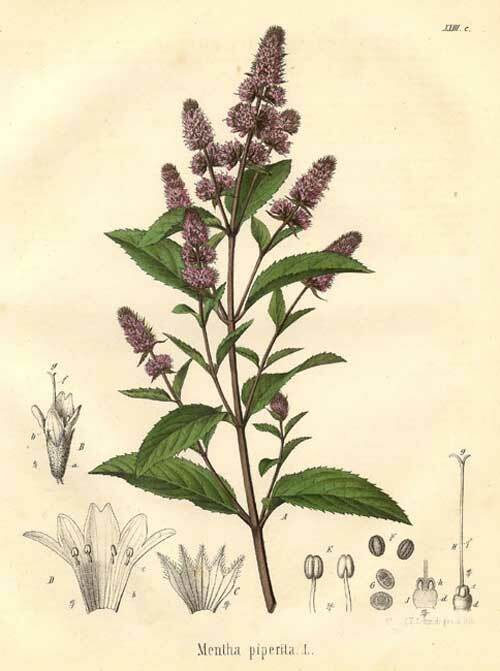 Dioscorides, a famous Greek physician who lived over 2000 years ago wrote that a spray of Peppermint worn on his cloak raised his depressed spirits. The Roman naturalist Pliny wrote that Peppermint 'reanimates the spirit' and he recommended 'hanging it in sick-rooms to assist convalescence'. The oldest surviving medical text, the Egyptian Ebers Papyrus, describes the virtues of Peppermint as a stomach soother. 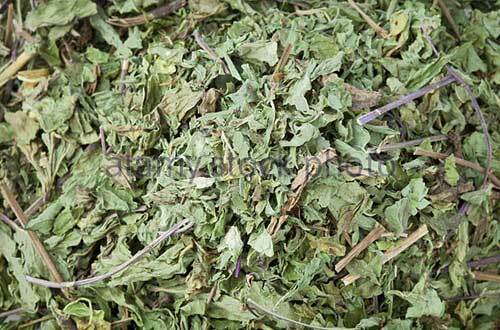 The herb was so valued in ancient times that it was accepted as a payment for taxes (just try doing that now!) In Luke (11:39) Jesus scolds the Pharisees "you pay tithes of Mint and Rue but have no care for justice and the love of God". Dried leaves have been found in Egyptian pyramids dating from 1000bc. Archaeological evidence would suggest that Peppermint (or at least 'Mint' as there are actually many hundreds of different kinds of mint) has been known and used by people for at least ten thousand years. Peppermint has been used since ancient times to assist a wide variety of digestive disorders where a mildly sedative and anti-cramping remedy is required. Such conditions include; colitis, travel sickness, excess gas, colic, nausea, vomiting and poor appetite. Peppermint also has a traditional use in fever treatments where its cooling effects can be very soothing in the ‘hot’ stage of a fever when the patient feels restless, agitated and overheated; notably distinct from when they feel cold and shivery. The British Herbal Pharmacopoeia (BHP) describes the actions of Peppermint as locally 'antiseptic & antipruritic (for itching) and internally as a spasmolytic, carminative, diaphoretic & antiemetic'. 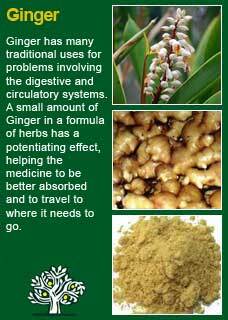 It says it is indicated for 'intestinal colic, vomiting of pregnancy, flatulent dyspepsia, common cold & dysmenorrhoea. The BHP recommends a dose of 2-4 grams of by infusion up to 3 x daily and suggests it may be combined well with Elder, Yarrow and Boneset in influenzal colds. D Hoffmann adds the actions of 'nervine, anti-inflammatory, aromatic and analgesic' and suggests a dose of 1-2mls up to 3 x a day of a 1:5 tincture made in 40% ethanol. Or a cup of boiling water over a heaped tsp (this will be just over 1gram) of the dried herb infused in a covered container for 10 minutes. It is thought that Peppermint may dry up milk secretions so it is best to avoid in quantity during breastfeeding. Peppermint was found to reduce the absorption of iron by 84% in a test of adult volunteers so it is best avoided taken at the same time of day as taking iron supplements. High doses of Peppermint oil are to be avoided and any amount of the oil should be used with caution for the very young. 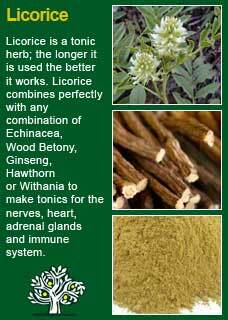 Aside from that Peppermint is very safe to use for pregnant women and for the young and old. One of its traditional uses has been to help with pain periods and, consequently, it has been linked to having an action on the womb that has seen some authors advise against its use in pregnancy. There is really no evidence to support this and, as it has helped many women with morning sickness of pregnancy and truly is safe to use throughout this time, it should be known as safe. 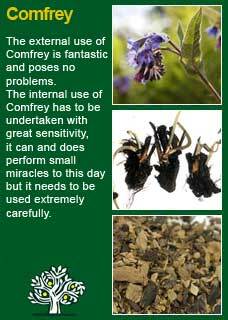 Taken internally it is quite clearly a cooling herb and I use as a lot of Peppermint in formulas where I want to improve the flavour at the same time as providing a gentle digestive tonic for someone who has a bit too much fire in their belly! 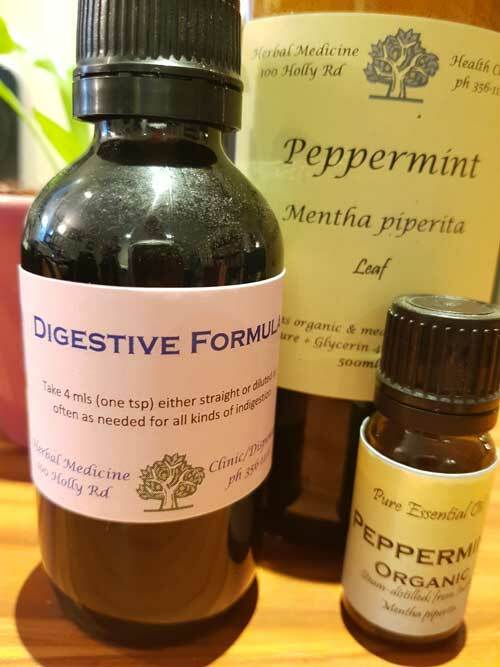 In the past I have also often tried using Peppermint oil in an enteric coated capsule (meaning it only gets digested after it passes through the stomach) for excess gas and cramping in the intestine. 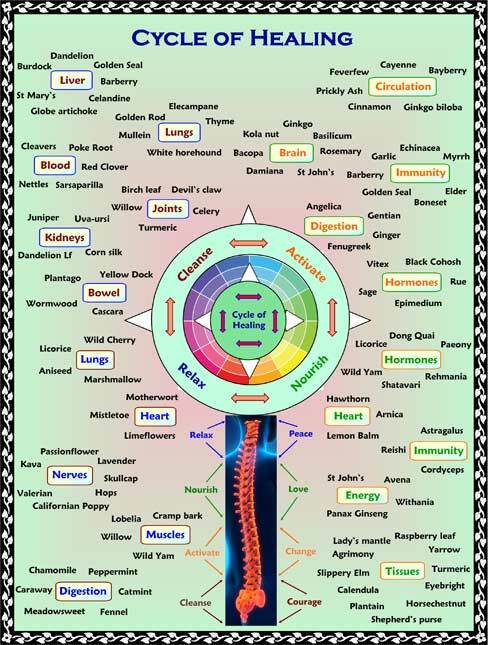 I think it has been quite successful in this regard but on balance I find using a blend of digestive herbs rather than just the Peppermint oil alone has been more reliably successful. Peppermint does not need to be in large doses to work and in fact I personally feel it works better in subtle amounts where the smell and feel is obvious but not overpowering. I guess I would add about 10-20 mls to a 200 ml tincture formula; an example below. Not more than a half a gram or so in a tea. 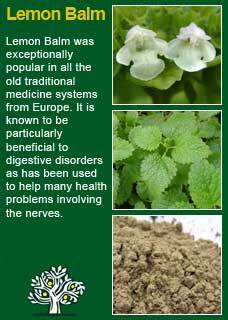 Peppermint combines perfectly with Licorice root and Ginger root for many functional digestive disorders and discomforts. Take a tsp, approx 4mls, as often as needed to quickly relieve indigestion, colic, gas, nausea, bloating and other such common torments to the digestion! 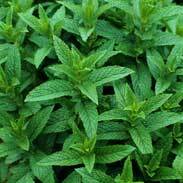 Much of the information here about the traditional uses of Peppermint is consistent with the model of thinking whereby one may treat problem A with plant B. There is value in this approach, especially in how it helps us pass on useful knowledge to one another, but it falls short in one vital area; and that is that people are not all cut from the same cloth! Something that works brilliantly for one person may do less for another -- why is this?